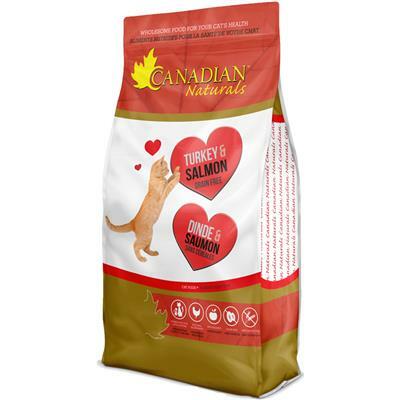 Canadian Naturals Cat Food - Turkey & Salmon contains real turkey, turkey meal, and salmon meal as the main protein sources. These delicious, lean flavours are combined with fruits and vegetables, such as spinach, sweet potato, banana blueberries, and cranberries. This ensures your cat is receiving a complete, wholesome diet. Turkey, Turkey Meal, Peas, Potatoes, Chicken Fat (stabilized with mixed tocopherols, a natural source of Vitamin E), Salmon Meal, Natural Flavour, Tomato Pomace, Egg, Flaxseed, Choline Chloride, Phosphoric Acid, Potassium Chloride, DL-methione, L-lysine, Fruits and Vegetables (Cranberry, Apple, Blueberry, Carrot, Spinach, Tomato, Sweet Potato, Broccoli, Pumpkin, Banana), Brewer's Yeast, Sodium Chloride, Vitamins (Vitamin A, Vitamin D3, Vitamin E, Niacin, Calcium Pantothenate, Thiamine, Pyridoxine, Riboflavin, Vitamin K, Folic Acid, Biotin, Vitamin B12), Minerals (Zinc Sulfate, Ferrous Sulfate, Zinc Proteinate, Iron Proteinate, Copper Sulfate, Manganous Oxide, Copper Proteinate, Manganese Proteinate, Calcium Iodate, Sodium Selenite), Rosemary Extract, Taurine, Yucca Schidigera Extract, Lactobacillus Acidophilus Fermentation Product, Lactobacillus Casei Fermentation Product, Bifido Bacterium Bifidium Thermophilum Fermentation Product, Streptococcus Faecium Fermentation Product, Spices (Peppermint, Garlic, Parsley, Green Tea Extract, Turmeric, Thyme, Rosemary, Cayenne, Cinnamon, Chamomile).